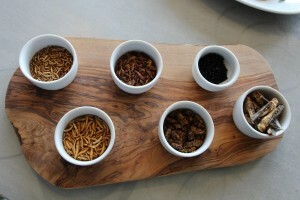 Edible insects at Grub Kitchen, UK. I cringed a bit as Andy Holcroft, head chef at Grub Kitchen (the UK’s first edible insect restaurant), described his first attempt at preparing food with insects. He had tried to make a dip out of mealworms, but ended up with a blender full of unpalatable gray slime. He realized at that moment that cooking with insects would be far different than the foods he’d prepared in his many years as a chef. A few years later, you’d never know it from looking at his menu – comprising an assortment of delicious insect-based and non-insect-based dishes, including toasted cumin mealworm hummus, dry-roasted seasoned insects, bug bhajis with cucumber raita, bug burgers, cricket and chickpea falafel, smoked chipotle cricket and black bean chilli, and cricket flour cookies. 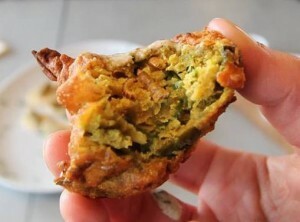 How did I – a vegan of over five years – find myself eating a bhaji comprised of (visible!) mealworms, crickets, and grasshoppers, you might ask? My Meat Debates class (in the Masters course on Food, Space & Society at Cardiff University) traveled to the beautiful Pembrokeshire Coast in west Wales last week to visit Dr. Beynon’s bug farm and on-site Grub Kitchen. After months of studying various ecological, cultural, geographical, health, and economic factors associated with livestock production and consumption, we’ve recently been examining themes related to the ontological nature of what exactly “meat” is: does in-vitro lab-grown meat count? What about insects? We took this trip to explore the latter question. Interestingly, Grub Kitchen and the edible insect component was just a small part of the overall operation, which opened last fall. Founder Dr. Sarah Beynon bought back her family farm and turned it into an academic research center, tropical bug zoo, youth learning hub, restaurant, and agroecological farm. In addition to growing insects and crops, the farm raises a small number of cows and sheep that serve important roles in conserving heathland – as opposed to grazing on monoculture rye, on which the vast majority of grass-fed cattle are raised. I was thoroughly impressed by how the center incorporates so many diverse components into its mission – research, education, sustainable living, reforming policies (they’re working closely with the British government to establish regulations for the edible insect agriculture industry), and incorporating art into public conversations (they’ve got visiting artists working on how to portray the importance of insect/soil biodiversity to Westminster, in public education campaigns, and in community art workshops). Bug bhaji, made with mealworms and other insects. A contagiously passionate entomologist, Dr. Beynon imparted an incredible amount of information about insects to us. She came to the field by studying dung beetles, and the complex role that a variety of dung beetle species play in decomposing manure, reducing methane emissions, and providing a host of other ecosystem services. We learned about how different species of insects respond to environmental conditions; locusts and mealworms, for example, release fewer stress hormones when swarming together. Hence they may “prefer” living in confined operations like insect farms. I appreciated her nuanced views about many of the complex issues at hand. For instance, when questioned about her ethics related to raising and killing insects for human consumption, she walked us through her struggle from being an active proponent of preserving insect biodiversity (and former vegetarian) to eventually also being a promoter of eating the very organisms she wants to preserve. She firmly believes that insects are animals, and should be treated as respectfully as other farm animals. Her farm kills the insects by freezing, viewed among some experts as possibly the most “humane” (quite an anthropocentric notion in itself) method of killing, as the cold temperatures put exothermic arthropods into a reversible state of coma until they eventually die. It is worth noting that this is still a contentious debate, as others argue that the more instantaneous act of shredding is preferable. How do we regulate the edible insect industry according to food safety standards? The British Food Standards Agency is trying to figure that out right now. For which insect species do we grant permits to produce in different places? Should we limit production to only native species? Should we import tropical insects produced in other parts of the world, as the transportation-related GHG emissions may be lower than the energy inputs needed to produce them in more temperature climates? How do all of the nutrients – protein, iron, calcium, B12, omega 3 fatty acids (found in high amounts in certain insects such as grubs), etc. – in insects change through different cooking and preparation processes? How about during human digestion (especially in interaction with other foods)? How do we avoid turning edible insects into another food commodity whereby multinationals begin patenting production processes and inputs (similar to GMOs and green revolution technologies)? Especially in light of the fact that consuming (and in some cases, raising) insects already occurs in many regions around the world, and this may reduce the access of poorer producers or consumers to the benefits of new/improved practices? And on a more personal level, should I dabble into entomophagy (the human consumption of insects) myself? Grappling with my vegan ethics, I considered my main reasons for avoiding animal products. As a privileged person with the ability to choose what I eat among a variety of nutritious and accessible plant- and animal-based options, I’ve reasoned that eating a vegan diet is the most ethical choice for my situation. I could try avoiding food from animals raised on CAFOs – a challenge in itself given that over 80 percent of beef produced in the U.S., for instance, comes from them – because I do not endorse how animals, workers, and local communities are treated within the prevailing system. However, plant proteins still require far fewer resources (water, land, energy, etc.) to produce than pasture-based animal products, meaning that a plant-based diet (with some other qualifications, such as avoiding air-freighted produce and limiting the amount of nuts consumed) has a far lower ecological footprint than one based on animal products. It’s especially critical for those of us in the industrialized world to reform our dietary patterns – and especially the policies, social norms, and other structural factors that shape them – in light of the absolute necessity to do so if we want to avoid or at least mitigate catastrophic climate change, and to ensure that billions of others around the world have access to food now and in the future, too. That said, I’ve always acknowledged that some animals can be raised in ecologically sound ways – on diversified farms that graze animals on land not otherwise suitable for arable farming, and reduce fossil fuel-dependent inputs by incorporating animal manure (free of antibiotics, arsenic, and other harmful feed contaminants) as fertilizer for crops. And in many places without access to plant-based and fortified alternatives, eating a small amount of animal products may be the only way to gain adequate nutrients for a healthy life. Moreover, I know that many cultures around the world respectfully co-habitate with animals – and still consume them – in ways that respect the animals’ wellbeing and lives. Yet to me (I know this is somewhat self-centered moralistic reasoning), it has then come down to whether I would be willing to kill an animal myself (as suggested by Michael Pollan in The Omnivore’s Dilemma). I’ve been to a slaughterhouse before, and on a sustainable farm where they beheaded “happy” chickens in the most humane way possible; in either instance, I just couldn’t imagine doing it. Hence, I won’t make someone else do my dirty work, especially given the abhorrent conditions for workers in most meat slaughtering and processing facilities. All of my reasons for not eating animal products don’t quite work in the case of insects, however. Insects fare far better on the feed conversion efficiencies, resource use, and GHG emissions counts than any other animal products (including dairy and eggs) and in some cases (such as by rearing insects on biodegradable waste) even plant-based proteins, though it varies significantly based on the type of insect and the lifecycle during which it was killed. I know that billions of insects are killed by the agricultural industry every day, and I could not avoid complicitly supporting this, even if I ate entirely organic produce free from synthetic pesticides. And despite trying to avoid killing most insects (my housemates and I lived with a pet spider in our bathroom for months), I myself have physically killed millions of them just by walking, driving (see: windshield), gardening (those exasperating harlequins, anyone? ), and with a vinegar trap to save our kitchen one summer from the invasion of fruit flies. In fact, I have likely eaten hundreds (if not more) of them as well, given that the FDA permits a certain amount of insects in nearly every food, from spices to canned vegetables. Hence, I decided to give the insect tastings a shot. I have to admit that beyond my moral quandaries, the visceral experience of eating insects was also a challenge to overcome. I admire Sarah’s and Andy’s philosophy of trying to normalize the practice by avoiding the use of “celebrity insect eating” – i.e. making people eat large, live insects as seen on Survivor. Instead, they concentrated on making insects just a regular part of a dish, such as components of the bug burgers or using cricket flour as a percentage of the overall flour in baked goods. They also took considerable effort to source insect species and lifecycle types that required the lowest resource inputs, shorter timeframes to produce, and had greater feed conversion efficiencies, otherwise many of the environmental benefits compared to animal products would be minimized. That said, I have to admit that all of this talk about “efficiency” and “productivity” did remind me a bit too much of intensive animal farming language. My verdict on the taste? I enjoyed the mealworm hummus and cricket cookies quite a bit; the bug bhajis were definitely more of an acquired taste, but still not terrible (given that I ate three of them!). With the recent fad in edible insects popping up all over, I was pleasantly surprised to see that the dishes were relatively affordable and not limited to a fine-dining crowd. The insects currently on the menu at Grub Kitchen are not yet sourced from their farm, though they hope to make this the case once the UK finalizes regulations for the edible insect industry in the next few months. Meanwhile, they’ve been importing insect products from the Netherlands, France, Canada, and Thailand (for those who are interested in ordering/trying out insect products themselves, make sure to buy “human grade” insects, not those intended for animal feed or pet food). More information on the evolving framework around the edible insect industry can be explored through WOVEN, a recently established network of edible insect researchers, businesses, and regulators. I left the farm feeling inspired, knowing that young people are out there crafting such creative and conscientious livelihoods, not confined to the typical silos of academic fields or the corporate/NGO/government/academia sectors. For those who happen to be in the UK and willing to travel to the western-most part of Wales, I recommend visiting. If nothing else, I encourage people to reflect on their views about eating insects, and about whether changing social norms and policies around them may be one part of our transition to a more sustainable food system. Definitely worth a look at Skye Blackburn (Edible Bug Shop) and Georgia Lienemann (Stirring Change). They’ve completely changed my opinion on eating insects and have shown me how to do it and yes, they taste delicious!